The Fifth Mountain is set in the year 870 BC. Israel is being ruled by Phoenicians and Queen Jezebel wants to ensure that the people follow her own faith, one she brought from her native land. So, she orders the death of all those who do not bow down to her God, Baal. One of these rebels is the Prophet Elijah. The Queen orders his death for refusing to obey her. Elijah flees to the lovely Phoenician city of Zarephath, which is also known by the Phoenician name of Akbar. This place was actually considered to be the abode of the God, though Elijah refused to acknowledge it. There he meets a woman who is a worshipper of Baal. Though their religious views differ and she is older than him, Elijah and the woman are attracted to each other. But they don't discuss their feelings openly. Meanwhile, Elijah, who has been sent to this place by an angel, wants to rid Israel of the tyranny of Queen Jezebel. But due to a surprising turn of events, the people of Akbar accept him as a sage. They consider him one of their own and come to him for advice and to settle disputes. As Elijah begins to bond with these people, he suffers from conflicting ambitions. He cannot decide whether to remain in Akbar, his adopted city, or to return to Israel. Subsequently, the destructive Assyrian invasion on Akbar worsens Elijah’s dilemma. In The Fifth Mountain, through the context of a religious tale, the author conveys the importance of finding one's own destiny, even if it seems like it will involve rebelling against God's will. He insists that in doing so, one will find oneself getting closer to God. Paulo Coelho is a Brazilian author. 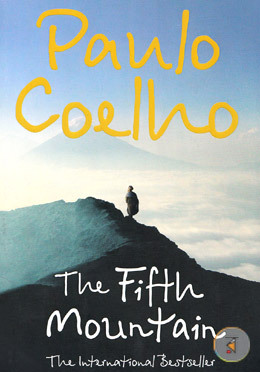 Other books by Coelho include The Alchemist, Eleven Minutes, Brida, and Manuscript Found in Accra. His books explore human values, ambition, and spirituality. Coelho was born in 1947 in Rio de Janeiro, Brazil. He enrolled in law school to satisfy his parents’ dreams, but later he dropped out and traveled through Europe, Africa, and Mexico, living the life of a hippie. On his return to Brazil, he became a successful songwriter. He then undertook the Road of Santiago de Compostela pilgrimage. This experience changed his life and he gave up his career in the music industry to fulfil his childhood dream of becoming a writer. The Alchemist is the novel that won him worldwide fame. He is now considered one of the most popular and respected writers in the world.